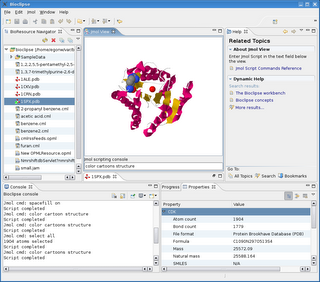 The Eclipse Rich Client Platform (RCP) is very powerfull, and takes a lot of architectural things of your hand when developing a bio- and chemoinformatics GUIs. Bioclipse is based on it. One thing the RCP offers is a Help View which works with plain (X)HTML files, and one neat feature is the context help. It is help shown in the Help View when one focused on a specific GUI element. 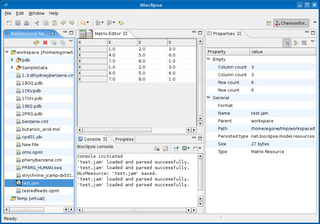 On the right side of the Jmol view (showing 1SPX) is the Help View, showing the context help for the Jmol View pointing to the 'Jmol Script Commands Reference'. 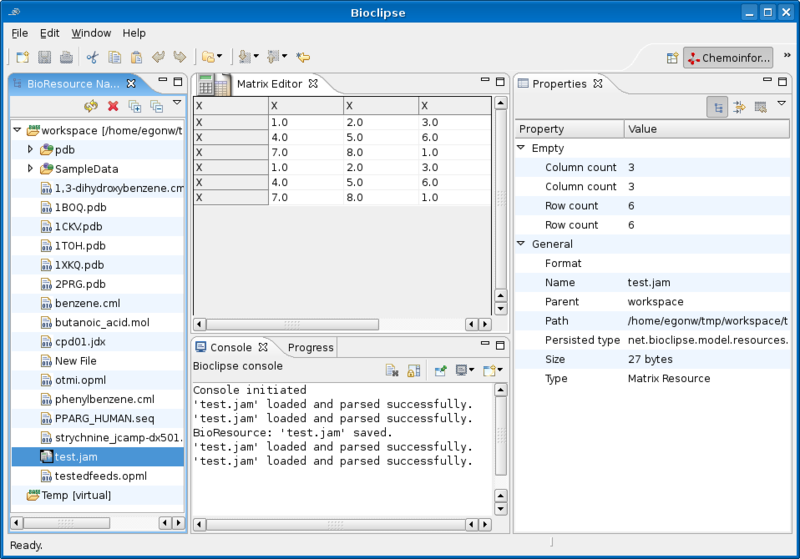 With chemometrics in mind (QSAR, data mining, ...), I have started working on matrix support in Bioclipse, because the matrix is the important step between (bio-)molecular content and statistical analysis. I implemented this such that the actual matrix implementation can be freely chosen, that is, bc_statistical provides a IMatrixImplementation extension point. The plugin bc_jama provides a JAMA based extension for this, but other implementations are possible, and possibly useful. The second component provided by the new statistics plugin, is the MatrixResource, a BioResource for documents (e.g. files on the harddisk) that represent a matrix. However, Bioclipse can create such matrices on the fly too, and these do not necessarily have to be stored on disk, as is general for BioResource's. This makes it possible for other plugins to create matrices from other resources: for example, the CDK plugin can now have an action that converts a SDF file into a QSAR data matrix. The next step is to work on column and row names, and replace those uninformative X's. As you can see in the Properties View, I also need to tweak adding and removing advanced properties a bit. And then it is time to have the CDK plugin create a QSAR data matrix. David Strumfels posted news about the Useful Chemistry CMLRSS feed. He explains how this feed can be accessed using Jmol and Bioclipse. The latter are accompanied by two AVI movies: one about creating a new OPML file, and one about accessing the CMLRSS file from the OPML. I started a spin-off blog earlier this week: kemistry desktop environment. It will deal with integration of chemistry on opensource desktops, with KDE as one of them. Today, it features an overview of earlier blogs on the subject in this new blog.